To kick off the holiday season, Cyara is spreading some CX cheer, along with warm season’s greetings. And in the spirit of sharing, we’ve rounded up insights and perspective from both brands and customer experience (CX) experts. As we pulled together this roundup, we realized that, while the holidays come but once a year, delivering great CX is a year-round endeavor! 1. Jingle all the way to merry customers. 2. Make your CX list, and check it twice. Delivering a great CX is all about the details. It’s not enough to have a great design, you need to check it with automated monitoring from the customer perspective to make sure you deliver on your promise. 3. The weather may be frightful, but your omnichannel CX can be delightful. Customers expect to have the context of their interactions with brands carry with them as they move from one channel to another. More and more brands are designing journeys to meet this need. To assure you deliver omnichannel journeys that work, be sure to test them as designed. 4. Like the Three Kings, follow yonder star to better collaboration. Key to your CX success is close collaboration between the business and IT. This ensures that requirements are clear from the outset, and ultimately fulfilled. 5. Cyara, with your nose so bright, won't you guide my CX tonight. 6. Deck your halls with CX quality and agility! To succeed in the face of market dynamics, look to adopt an Agile/DevOps approach to accelerate your CX innovation while simultaneously improving quality. 7. More efficient than little elves at the North Pole workshop. 8. Kids may be writing to Santa, but your customers are not sending you feedback. CX leaders need ways to assure their CX without relying on customer feedback, because 96% of customers don’t voice their complaints. Turn to your real-time operational CX data to complement those NPS and CSAT scores. Watch this webinar to learn how to build a strong CX metrics program. 9. What if CX doesn't come from a store. What if CX, perhaps, means a little bit more! 10. Yes, Virginia, top brands do win on CX. In today’s experience economy, companies who deliver a stellar CX are reaping rewards. In fact, according to research from Temkin Group, 87% of consumers who’ve had a very good experience are likely to purchase more from that brand, vs. only 18% of those who’ve had a very poor experience. 11. Experience CX peace and joy. Comprehensive CX assurance brings peace to all your customer journeys, and joy to you and your customers! 12. Ring in the new year by resolving to raise the bar. Customer expectations continue to rise— meet their expectations and find new ways to even exceed those expectations. As the new year approaches, resolve to raise your CX bar even higher. 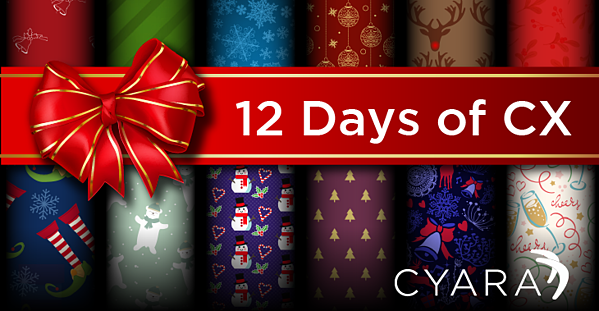 We hope you've enjoyed our 12 Days of CX tips and insights. If you'd like to learn how Cyara can help you make the CX of your dreams come true, contact us!